The Sailing Drip Tip is specially designed for the SMOK TFV8/TFV12 tanks. 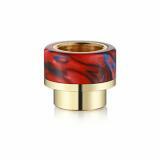 With SS Gilding and Epoxy Resin material, the Sailing 810 drip tip will bring you great vaping time. 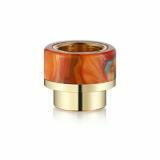 These drip tips are well-designed with beautiful appearance. 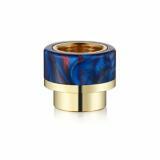 Say hello to the high-quality Sailing SS Gilding and Epoxy Resin 810 Drip Tip! Made of high quality SS and Epoxy Resin material, the Sailing Drip Tip is very durable and heat-resistant. And the Sailing Drip Tip is designed for SMOK TFV8/TFV12 atomizers. 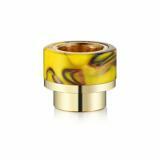 With exquisite snakeskin patterns and various resin color, it will bring you colorful vaping experience. Just get it as a spare part. 1pc each pack. The color is random. • It's for SMOK TFV8/TFV12 tanks. • Please note that the color is random and we are sending them our randomly. 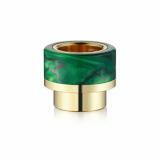 Sailing SS Gilding and Epoxy Resin 810 Drip Tip for TFV8/TFV12 for tfv8/tfv12 tanks e cig 810 mouthpiece is for sale and ecig56355 with a Gilding Epoxy Resin Snake Pattern 810 Drip Tips For E Cig.